Patterns have greatly improved the development of programs and software by identifying practices that could be replayed and reused in different software projects. Moreover, they help to communicate new and robust solutions for software development; it is clear that design patterns are a set of recipes that are improving the production of software. When developing models of systems, we are waiting for adequate patterns for building models and later for translating models into programs or even software. 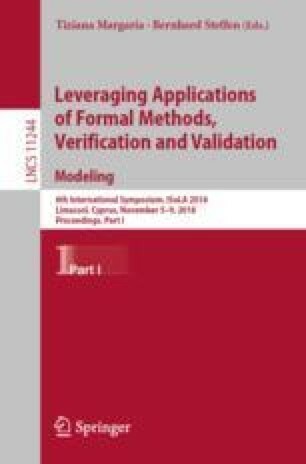 In this paper, we review several patterns that we have used and identified, when teaching and when developing case studies using the Event-B modelling language. The modelling process includes the use of formal techniques and the use of refinement, a key notion for managing abstractions and complexity of proofs. We have classified patterns in classes called paradigms and we illustrate three paradigms: the inductive paradigm, the call-as-event paradigm and the service-as-event paradigm. Several case studies are given for illustrating our methodology. This work was supported by grant ANR-13-INSE-0001 (The IMPEX Project http://impex.loria.fr) from the Agence Nationale de la Recherche (ANR).